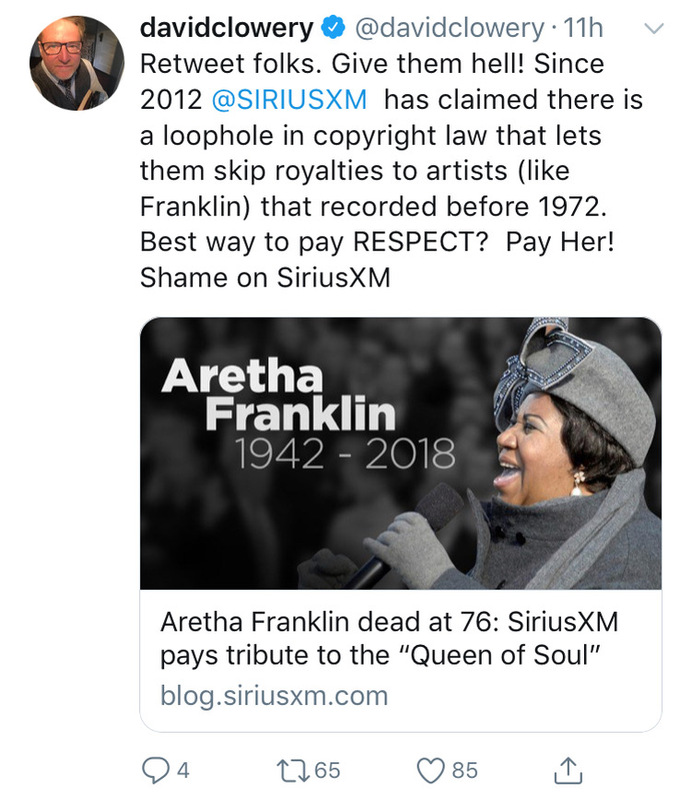 Efficient & transparent licensing, better matched & increased royalties, transparent accounting & consequences, improved court proceedings for performance royalties, payment of royalties to legacy artists, & payment of royalties to producers and engineers are just the highlights. 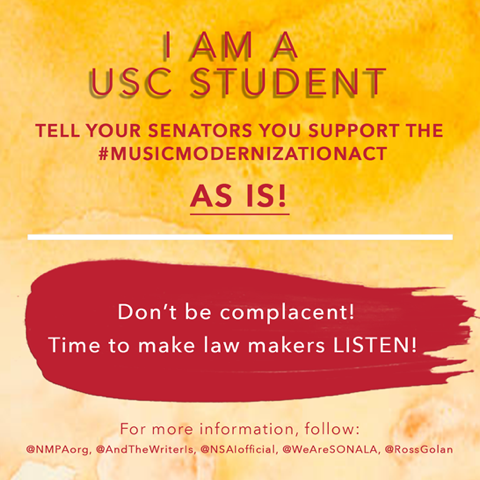 There will be plenty of slides, pictures and letters to senators to share throughout the week! The billboards get launched in Portland on Monday. Salem to follow the next week. Portugal The Man begins their shows this weekend. 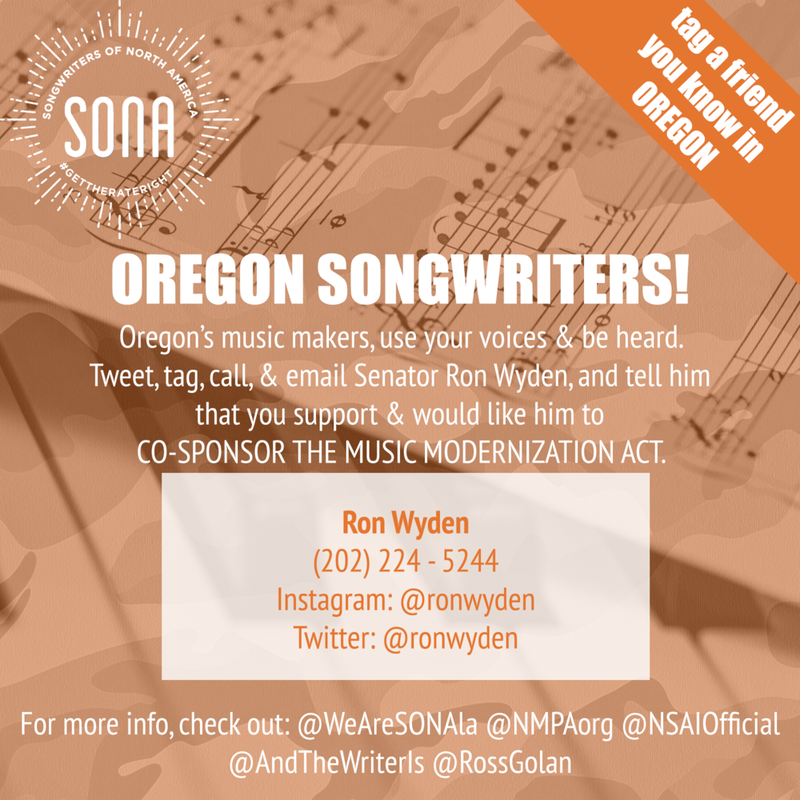 If Wyden doesn't know about the Music Army... He's about to." 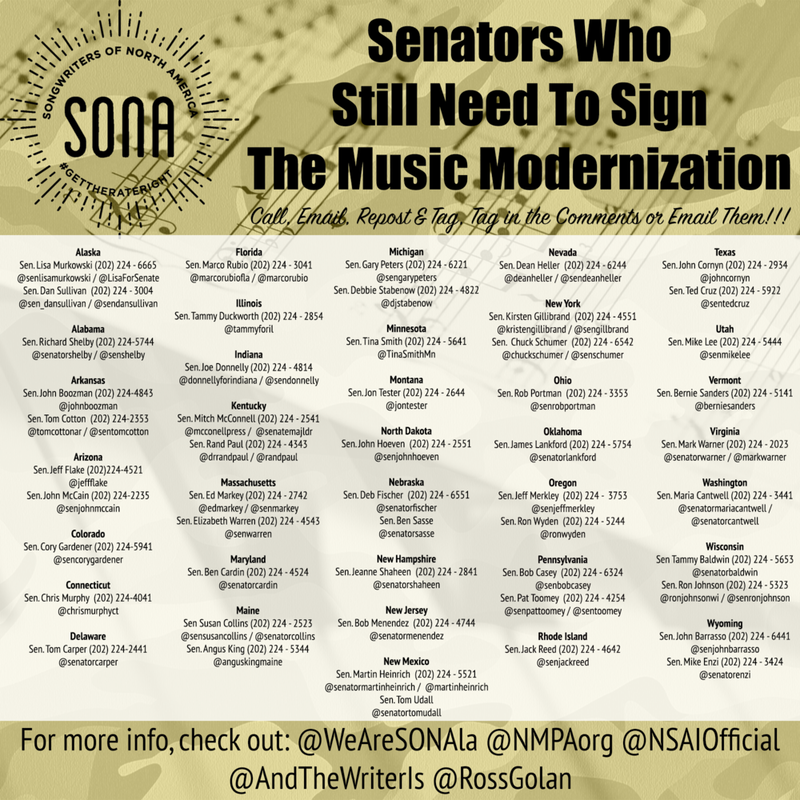 We placed an OpEd from songwriter Ashley Gorley in the Kentucky Courier-Journal titled "A bill to help songwriters get paid needs support of McConnell, Senate." Click here to check it out. ASCAP also promoting on socials - would be great if you could help amplify online. "Great quotes by Steven Tyler on MMA" Check them out by clicking here. "Here another where he mention's Doug Collins" Check them out by clicking here. Please read, share and keep going! 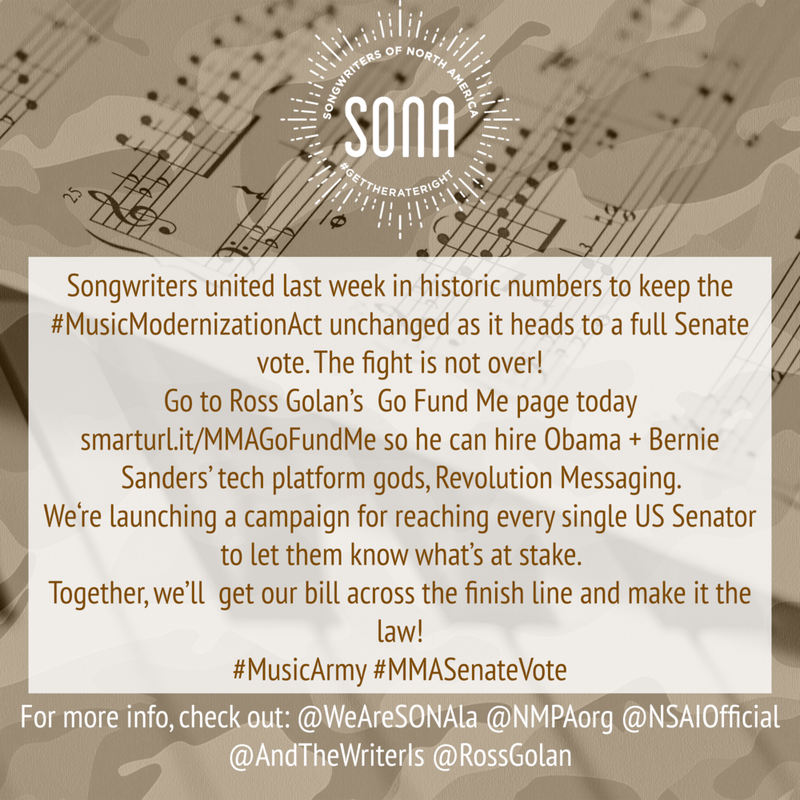 ~Songwriter's of North America, The Music Army. Some amazing news to report… we have TWO new Senate co-sponsors on the Music Modernization Act as of this morning. Plus Senator Hatch, which brings us to 60 CO-SPONSORS!!!! 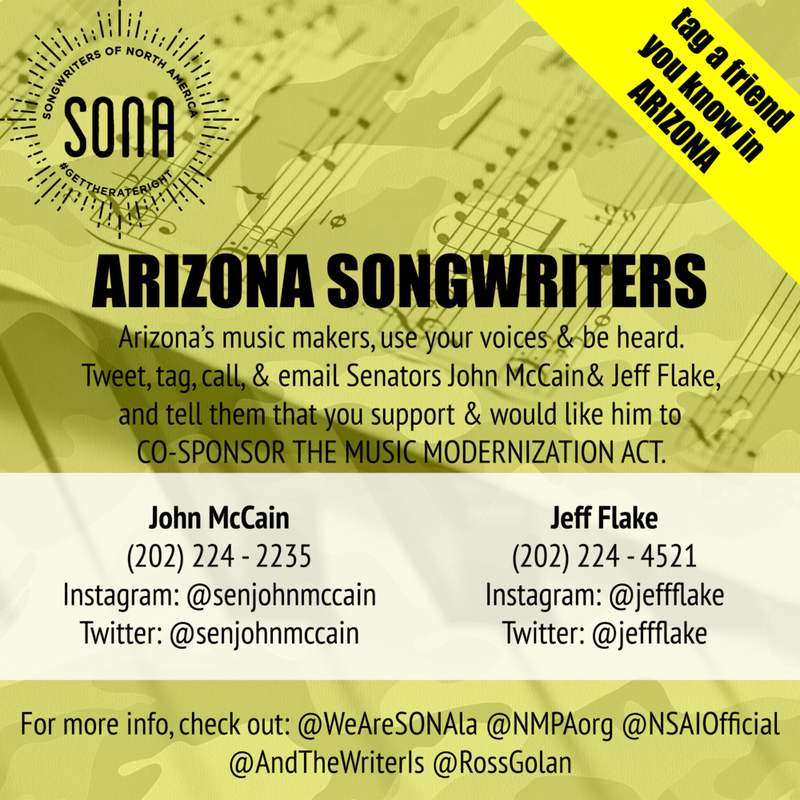 Please feel free to thank our newest co-sponsors on social media for doing their part to help American music creators. 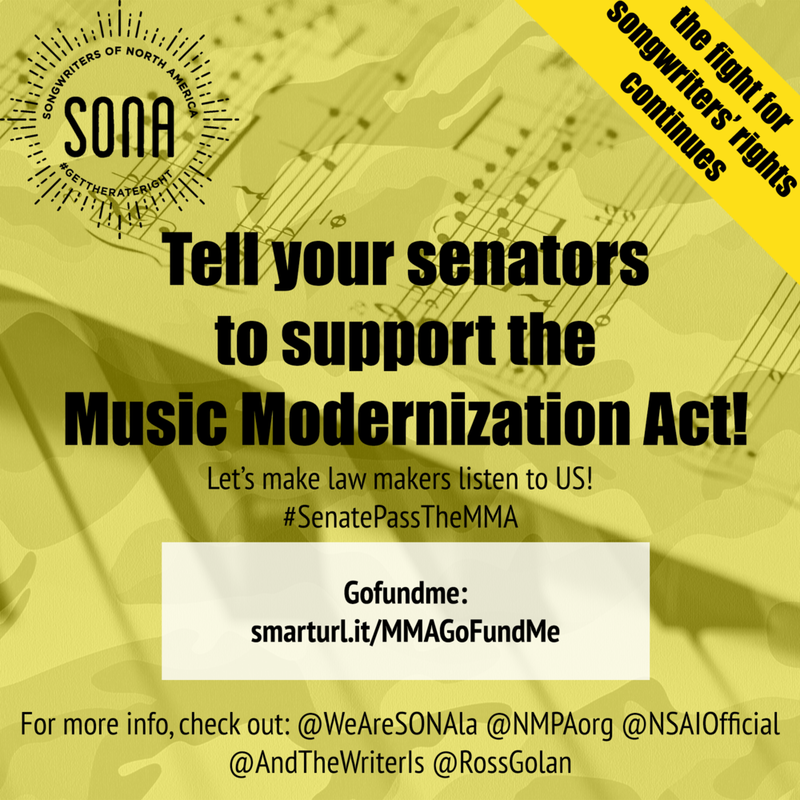 Meanwhile, if we get to 66 co-sponsors we’ll have 2/3’s of the Senate on board and all the momentum we need to request a vote by unanimous consent soon after the holiday weekend. Let’s keep going! We have momentum on our side and Senators Stabenow (MI) and Murphy (CT) are very close to co-sponsoring. Keep asking. 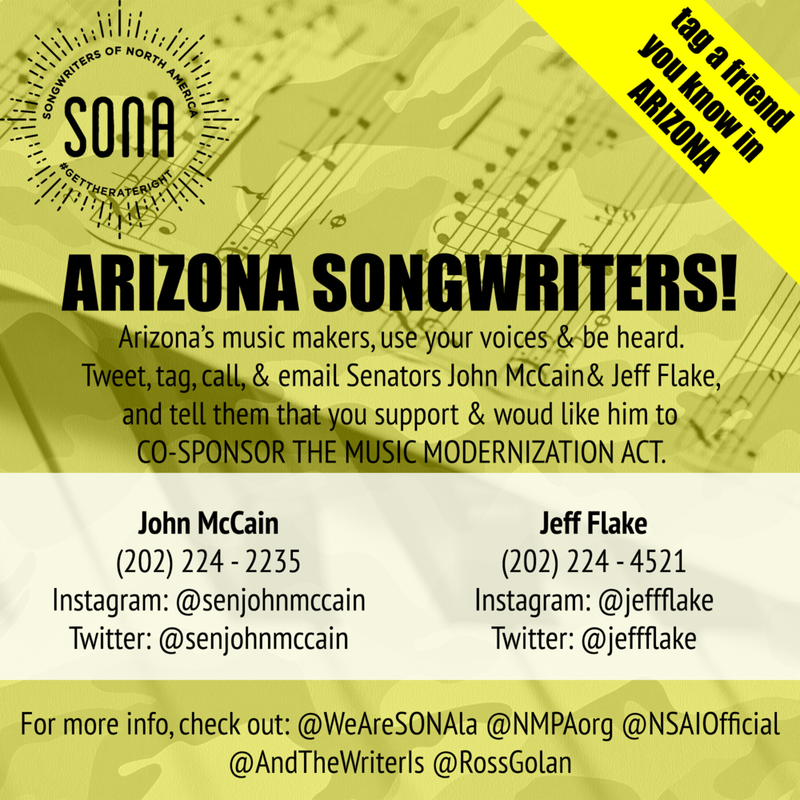 As you know, we had 2 additional co-sponsors sign on this morning, plus Senator Hoeven (NV), later in the day, giving us the magic number of 60… 61 if you include Senator Hatch. 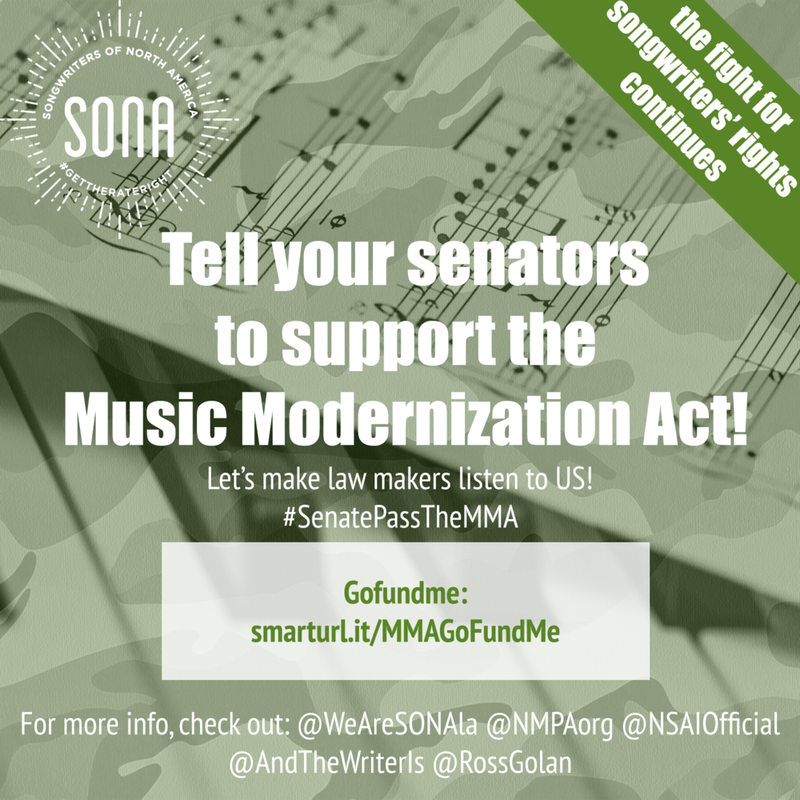 While all of the stakeholder lobbyists and representatives in DC, along with our MMA Senate sponsors and their staffs, have been working their asses off to garner support on the Hill for a long time now, they’ve told me repeatedly that the personal outreach from YOU - particularly in-state songwriters and artists with direct connections to these senators - has been immeasurably important in converting the “almost’s" to “yes’s." Kay Hanley (and her mom!) with Senator Markey in Massachusetts! Just as important as the co-sponsors, the Senators with “issues” - Gardner and Wyden - have been bravely taken on and pushed back at by songwriters and artists in Colorado and Oregon, led by Ross Golan and Ryan Tedder. 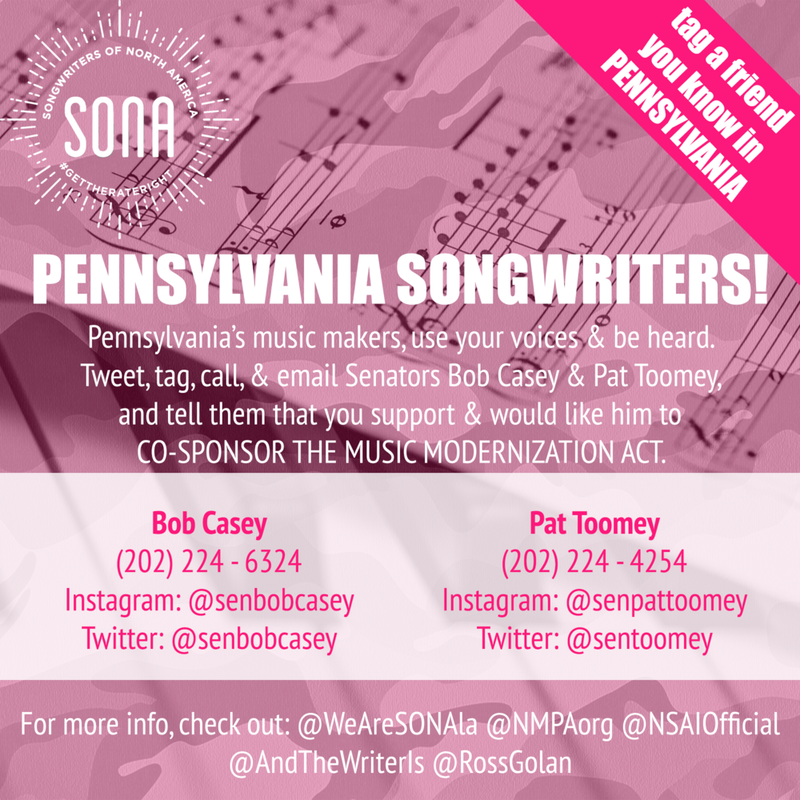 And thank you to Billy Mann and Jack Kugell for easing Senator Casey toward a more amenable position as well. On top of that - the power of all of you on this list... tweeting, posting, emailing and calling as we push toward the full Senate vote - has been everything. Let’s bask in this moment with some thank you’s for now. Here’s a thank you slide. 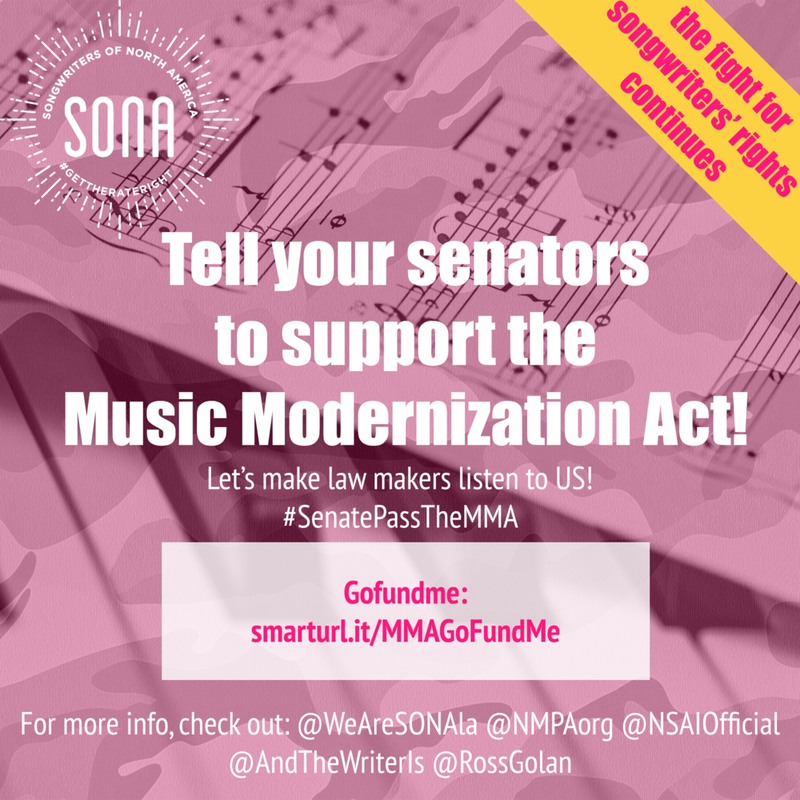 Don’t forget to @ known writers and artists from each state and use the hashtags #SenatePassTheMMA and #MusicModernizationAct in the caption. Today was amazing. We have FOUR new senator co-sponsors. With Senator Hatch we are at 57! Can we get 3 more to co-sponsor by the end of the week? Tweet of the day was by Steven Tyler (you know, some guy in a band from Boston). Speaking of Boston… SONA has a great relationship with Senator Ed Markey (MA). 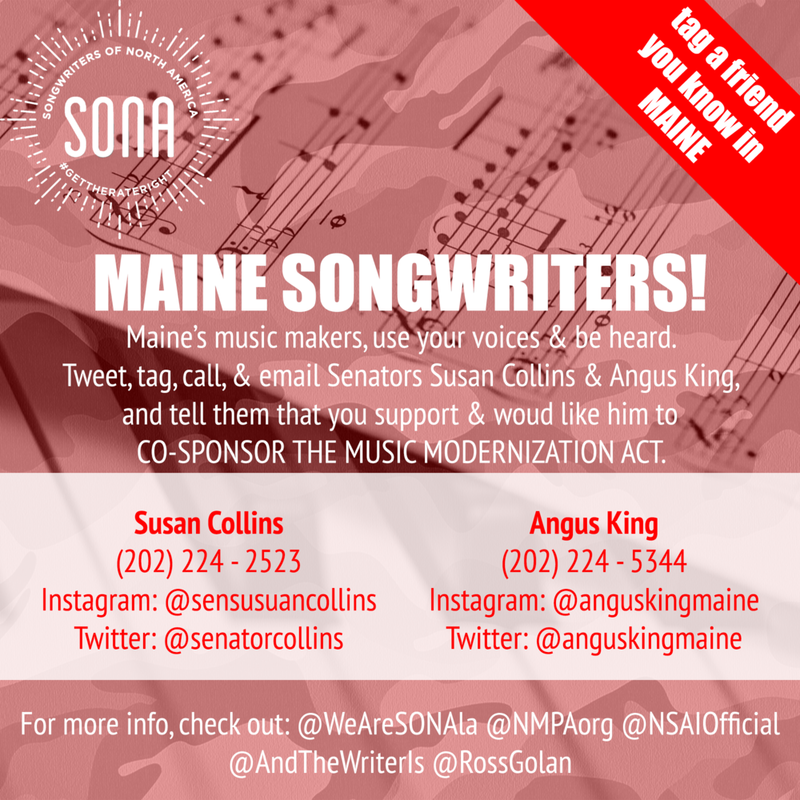 Tweet @SenMarkey letting him know if you are a SONA member and ask him what he’s waiting for! Next, pile on Michigan! Both Senator Peters and Senator Stabenow are sooooo close. (Thank you Darrell Brown!). Tag Michigan artists and let them know their senators are waiting to hear from them about the MMA. Shouldn’t be hard to think of great ones… Hello, Detroit??? 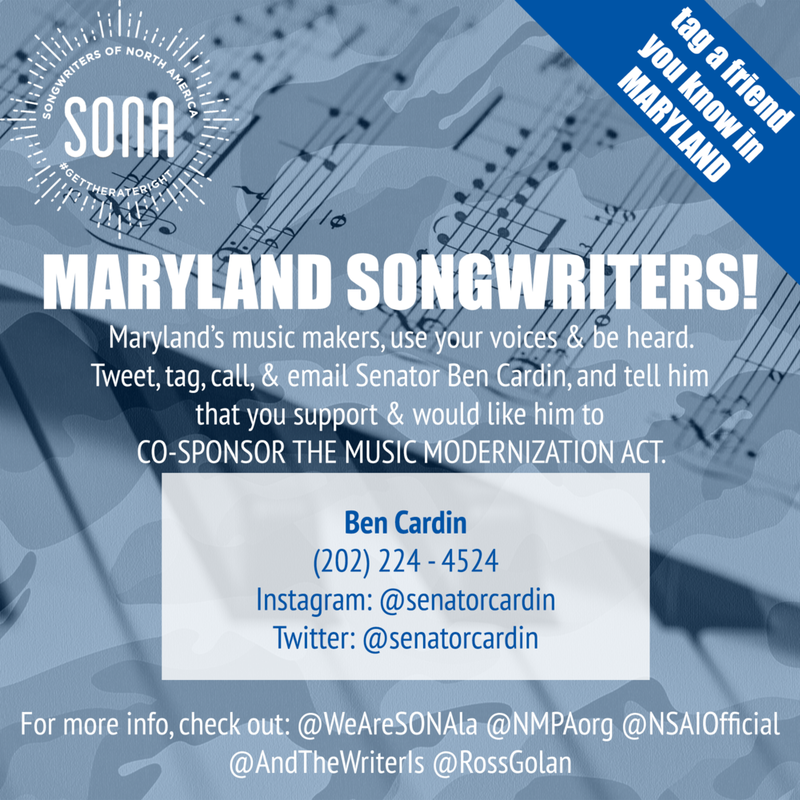 And while you’re at it, holler at Senator Cardin (MD). He is close as well. 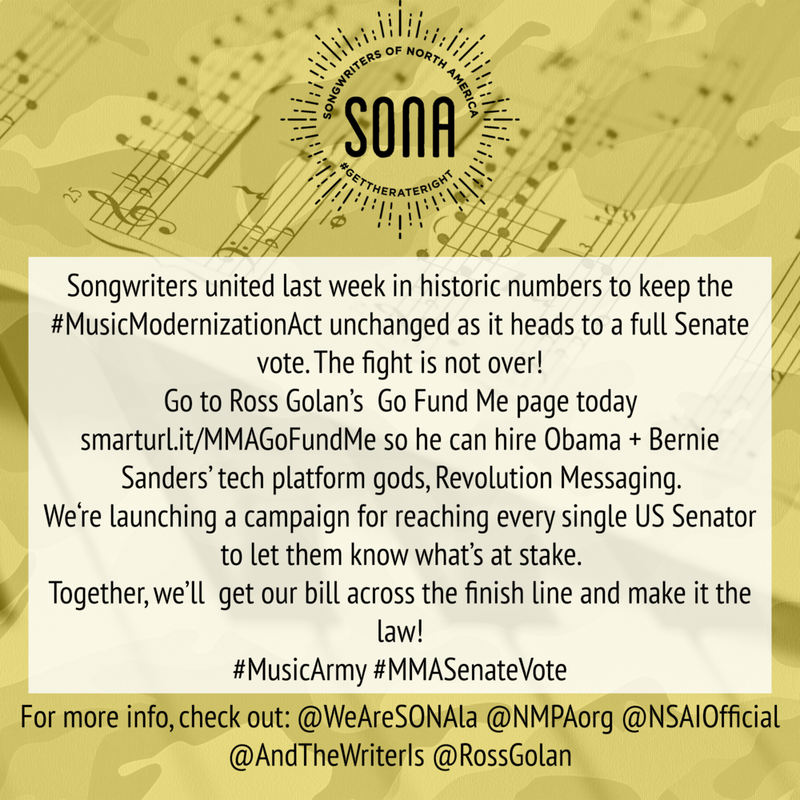 Tweet @wearesonala if you need anything from us - shareable slides, Senate office contact info, MMA info, etc. Let’s begin with the Co-Sponsor Count! Senator Smith (MN) agreed to co-sponsor today. Was Dan Wilson the clincher or was it Jimmy Jam? Who knows, but it was probably a combo plus the outpouring of Minnesotans who called, tweeted and sent emails. Nice!!! And so we’re ending this week at 52 co-sponsors. Wow. 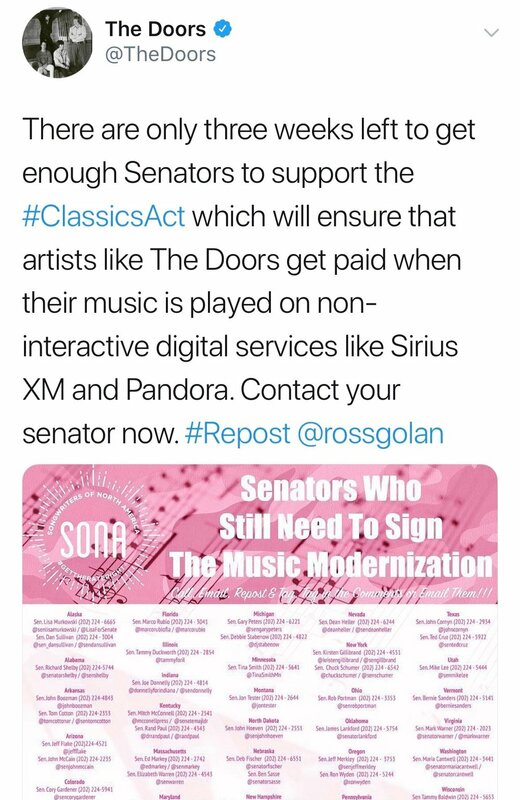 From Lauren Iossa (ASCAP) - Adding to the mix, ASCAP continues to push hard on socials with our campaign and we have done a recent slate of grassroots now in all 50 states with targeted messaging in several states. 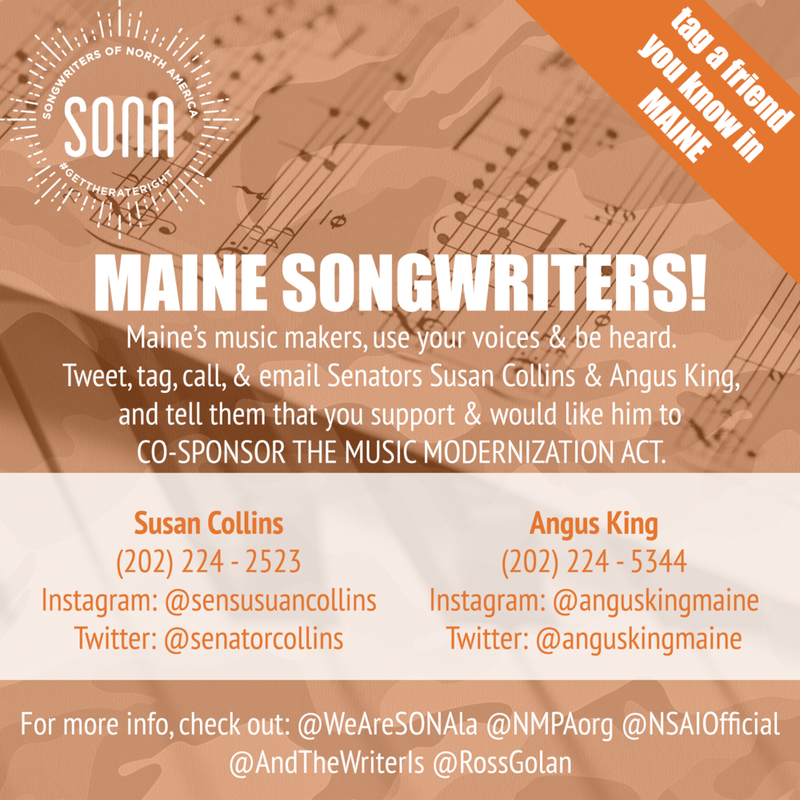 Paul also enlisted Jason Mraz to sign a personal letter to Senator Warner (which he has done -- we will deliver today or Monday). And, we are placing an OpEd by Ashley Gorley in one of the big Kentucky papers (we hope) to put some home state pressure on McConnell. Paul Williams is also doing personalized letters to all Senators who have not yet co-signed which we will also have hand delivered. 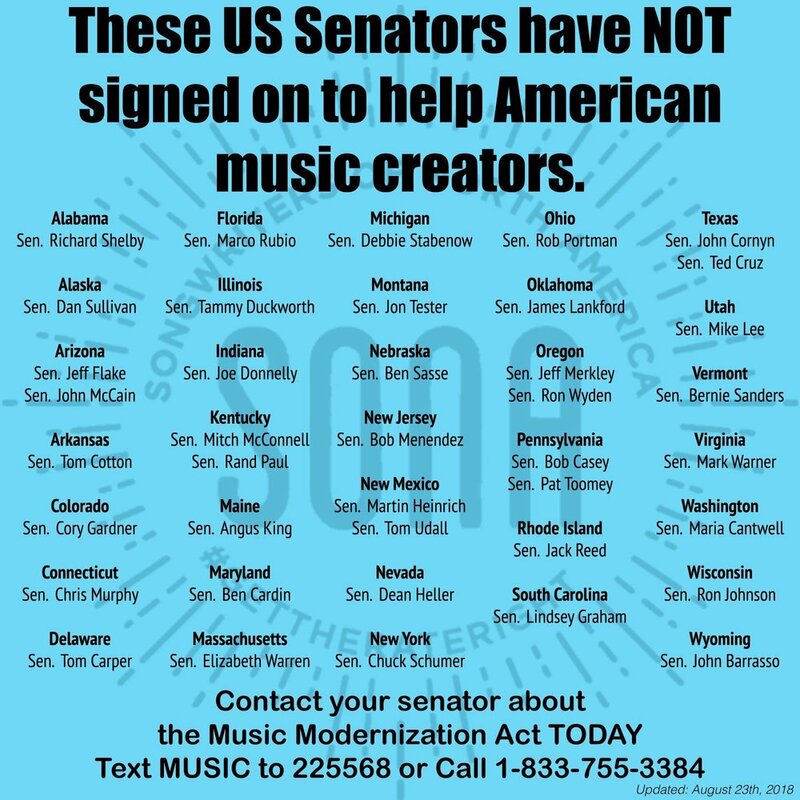 From Busbee: Quincy Jones has written letters to send to Senators Gardner, Wyden, Schumer, Warren, and Gillibrand. 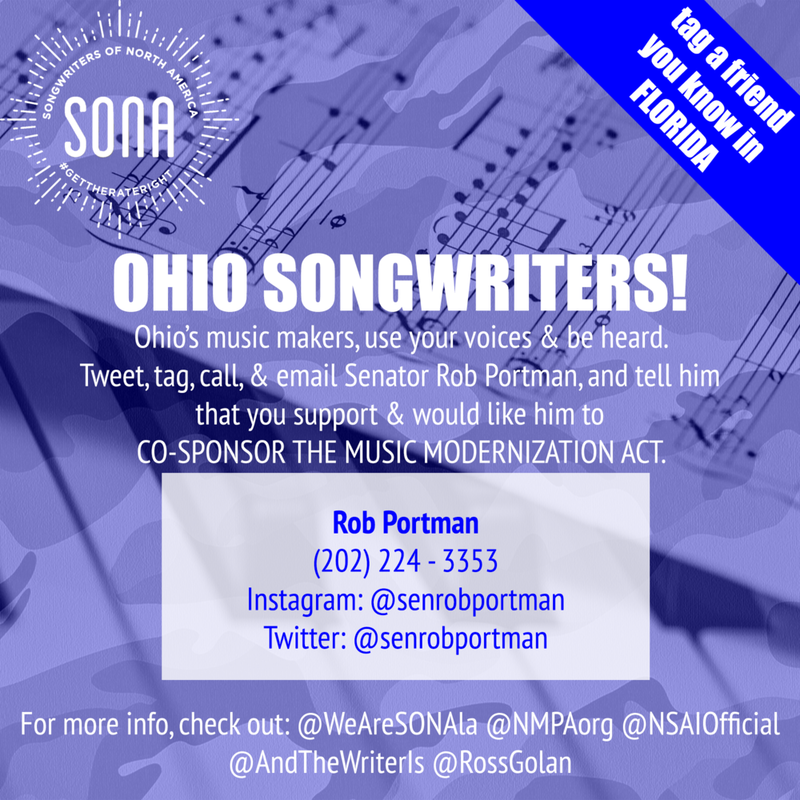 (as an aside, SONA’s Adam Dorn and Adam Gorgoni were consulted on the letters and helped draft them) #Teamwork! 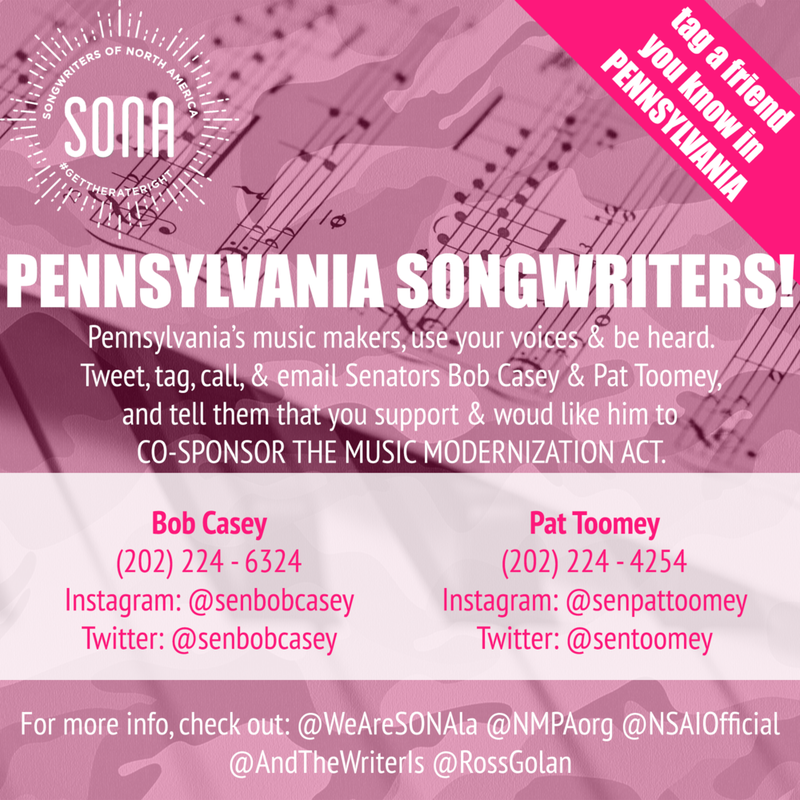 Targeted States - We’ve been making lists of well-known artists and songwriters to tag in the slide caption and we’ll keep adding. Personal calls from well-known artists and songwriters are really having an effect. 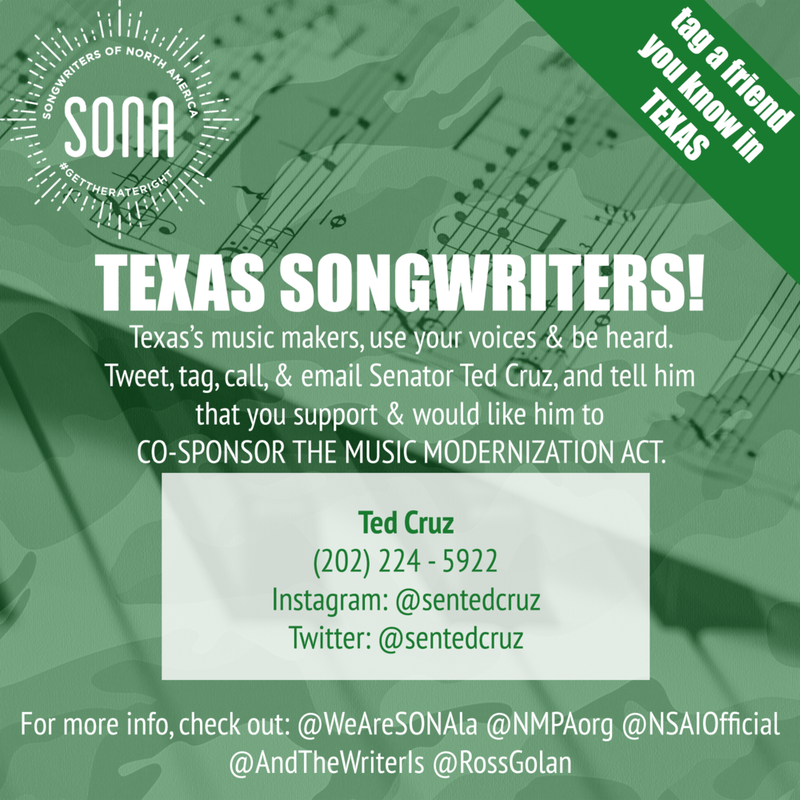 Many of you receiving these updates have replied to tell me about your personal calls to senate offices! Thank you! We know they are working! VMA participants and friends of participants - get someone to say something about the MMA during the award ceremony this weekend! It’s national television, for f$%k sake! On Monday we’ll blast the Revolution Messaging call tool 110%, feat. Maren Morris! Many music college students will be back on campus next week - so we’ll begin the student outreach next week. Nice work everyone… Whew. Have a great weekend! 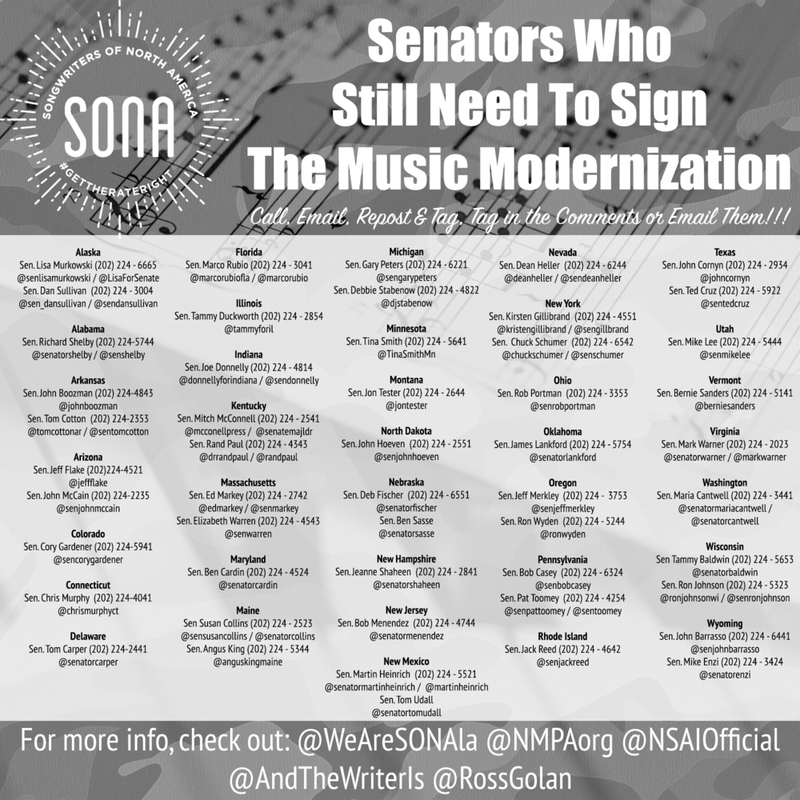 We are currently at 48 co-sponsors after Senators Moran (KS) and Scott (SC), both Republicans, co-sponsored last week. 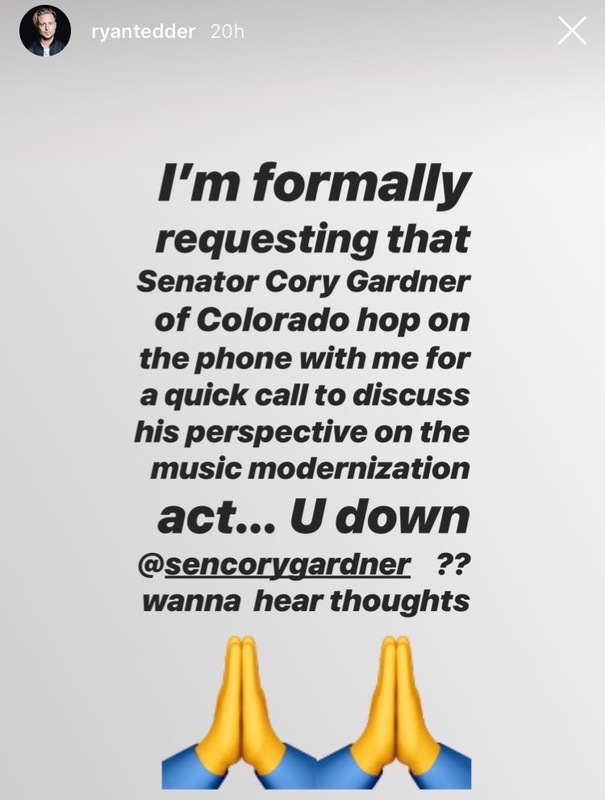 Speaking of Senator Gardner, check out the screenshot of what Ryan Tedder did! Desmond Child posted on the Latin Songwriter Hall of Fame website, headquartered in Miami and targeting Senator Cruz, check that out here. SONA Exec Committee member Jack Kugell got some amazing acts to spread the word in support of the CLASSICS Act! WSJ - "Jody Gerson, CEO of Universal Music Publishing Group, says songwriter fees ‘are not where we want them to be.’ PHOTO: JOHN MICHAEL FULTON"
Daryl Friedman & The Recording Academy hit hard today with this photo. Amazing WSJ article on MMA! Check it out here & repost! 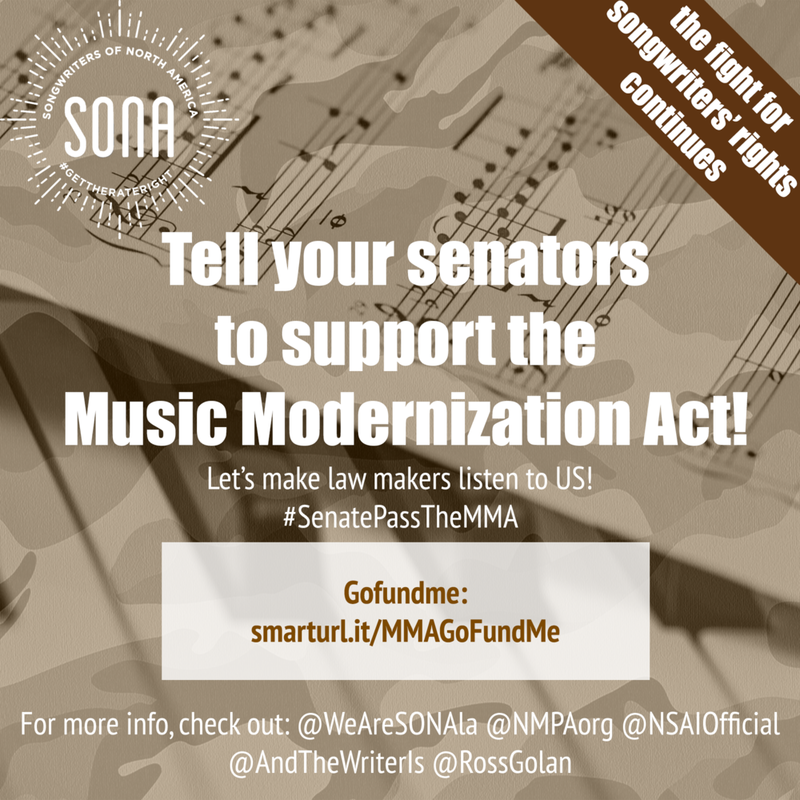 Ross Golan launched #MusicModernizationAct Pledge with this. Feel free to share. Andrew Gould will be overseeing a school outreach - if you went to music school, comment on this post & hopefully your school will be next. Feel free to share any of these graphics on Social Media!